Posted on January 16, 2019 at 7:03 PM. Screen is to show off a new inkjet press, the Truepress Jet520HD+(plus), at next month’s Hunkeler Innovation Days (HID) event in Lucerne, Switzerland. The ink is Screen’s own SC ink, which was first shown at the last Hunkeler Innovation Days event in 2017. In theory Screen can also supply the older MD ink though in practice all customers opt for the SC ink which can print to offset coated stocks. 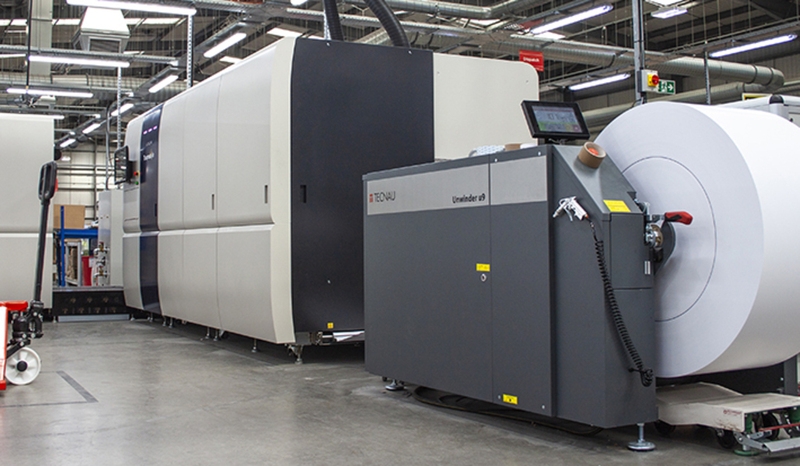 The net effect of this improved drying system is that the press can handle a wider range of substrates, including both lightweight coated stocks and heavier weight, coated offset stocks and that it can run at faster print speeds for offset coated stocks. Thus it should be able to run at 120mpm with 600 x 1200 dpi resolution, a marked improvement over the standard version, which typically achieved the higher resolution prints at 50 or 75mpm. This should certainly be one of the highlights of the HID event. Screen is also working to develop an option to run the press at 150mpm at 600 x 600 dpi. This is still being tested and is likely to involve changes to paper profiles and possibly some upgrades to the licensing or even an additional server. In addition, existing 520HD presses can be updated to the new HD+ version. The conversion takes about a week, and involves adding in the new NIR dryer and then changing the paper profiles to take account of this. Bluetree Design and Print in the UK and Bertelsmann in Germany are already in the process of upgrading their 520HD presses. It’s worth noting that although Screen and Ricoh collaborated to develop the Jet 520HD, which Ricoh sells as the VC60000, the two companies have taken different approaches to building on this platform. Thus Ricoh uses its own ink and has developed a different kind of drying unit for its VC70000, as detailed here. Screen will also show the Truepress Jet520NX at the HID event. Screen has now added IPDS as well as PDF/VT support to this to increase its appeal to the transactional market. It doesn’t run the SC ink but does offer 1200 dpi resolution making it an interesting option for some direct mail and transpromo applications and even for some book printing. Click here to access the original article by Nessan Cleary posted on January 10, 2019. Get sneak-peek announcements on the newest technology we have been developing, technical support and industry-leading articles.